I love all (most) things trendy and statement necklaces are no exception. 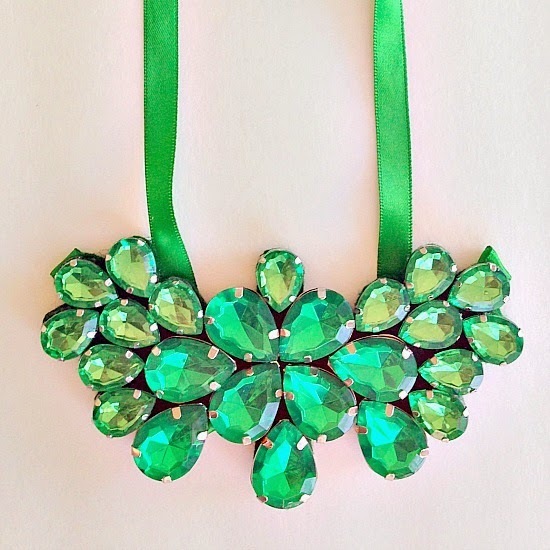 What better way to rock such a huge, fun necklace than on St Paddy's Day. 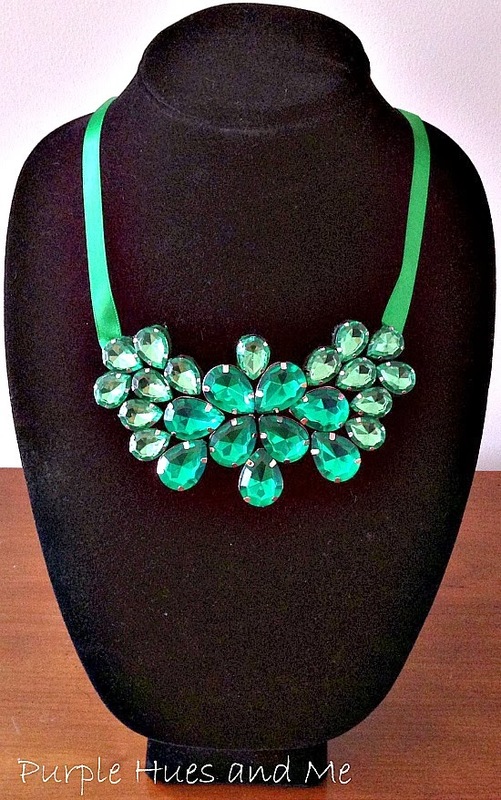 If you don't have anything green to wear - and you know if you don't, you'll get pinched - then make this gorgeous, bold, statement necklace and have everyone be green with envy when they see this beauty. Here, rhinestones are glued to felt that's then cut out twice and glued together with ribbon ties between making this a darling wearable craft. So grab your rhinestones, felt, ribbon, E6000 glue, tacky glue, and scissors while checking out the following descriptive photos and you could be making this necklace in less than an hour. Lay out your stones on the felt in different ways to come up with a design you like. I combined different shades of green, from light to dark, to create this pattern. I switched the stones around and came up with this. I liked this look best and glued the stones on the felt using E6000. Once the glue dried I glued on another piece of felt to the first one for additional backing strength using tacky glue. It probably would have been easier to glue the felt together first before adding the stones, but I didn't realize how flimsy the felt was at first. After drying, I cut out the felt backing around the shape of the stones, leaving an opening between the two felt pieces on either end for the ribbon ties. Ribbon ties were then glued between the two pieces of felt that was left open on either side. Statement necklaces add excitement to any outfit. From a sleek form fitting black dress to a basic plain t-shirt and jeans. 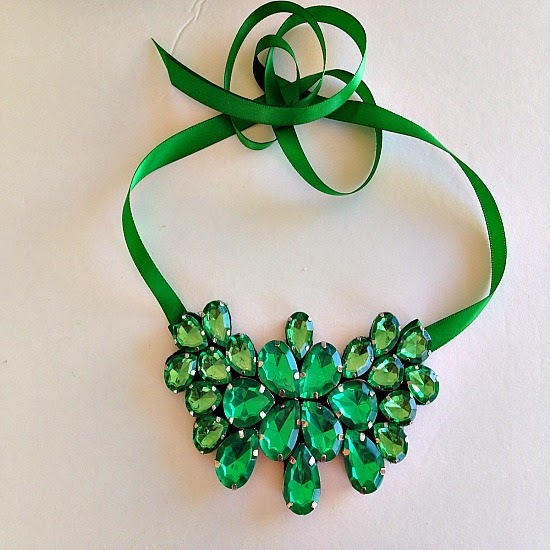 What better way to add that much needed green to your wardrobe for St. Paddy's Day then with this bold statement necklace? Your necklace is amazing. You should sell them. Excellent idea! You did a wonderful job on it! I was just thinking I really don't have any green clothing but an accessory like this can fix that up real fast! Have a Happy St. Patrick's Day! I have a few statement necklaces and always get sweet comments. This necklace is wonderful! Thanks for the instructions. Have a Happy St. Patrick's Day! Very clever, Gail. This is a darling idea! To be sure to be sure, you're going to make everyone green with envy on st paddys day. 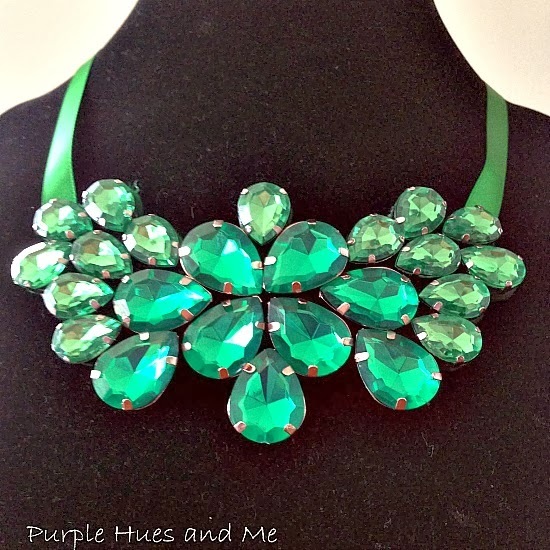 Oh everyone will be green with envy over this statement necklace. How fun to play around with a bunch of sparkly jewels for a perfect layout. It turned out fabulous! I am clueless when it comes to jewelry and did not know the term "statement" jewelry. However this cool, green beauty is truly a statement! Never thought of gluing rhinestones to felt. What a lovely and perfect creation for St. Patty's Day....any other day for that matter. I think I would make the shamrocks rock if I had that to wear tomorrow to the party! Beutiful! Thanks so much for taking part in the 6th annual St. Pat's Bog Crawl! Slainte'! You will definitely be the "Belle of the Ball" wearing that fabulous necklace. I cannot believe that you made it - wow!! It is perfect for "wearing of the green"!!! Gail! How fabulous! 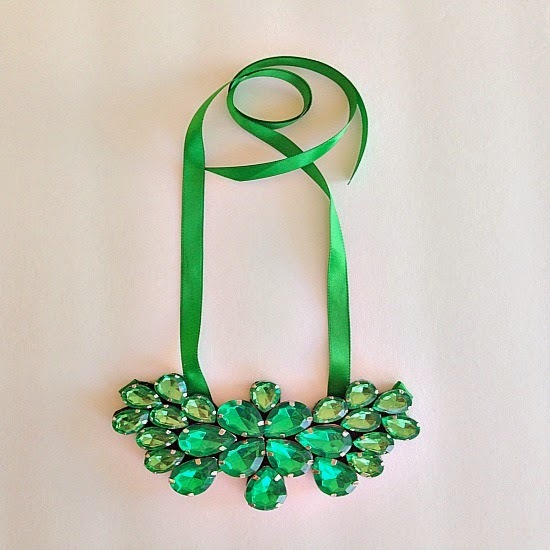 Please tell me you ARE going to wear this necklace to a divine place on St. Patrick's Day. Your idea could be made for so many different occasions, seasons or holidays. Thanks so much for sharing it with us! I haven't been wearing necklaces for 5 months because of the scarf wearing that is necessary over here during winter. But now when spring comes along I might make something new for myself.